Modern Warming – Climate Variability or Climate Change? | Watts Up With That? “Weekly or daily weather patterns tell you nothing about longer-term climate change (and that goes for the warm days too). Climate is defined as the statistical properties of the atmosphere: averages, extremes, frequency of occurrence, deviations from normal, and so forth.” Shepherd. Climate timeframes and relative scales observed in paleoclimate data are illustrated in Figure 1. The glacial cycle repeats approximately every 100,000 years and consists of an interglacial and glacial period. Cold glacial conditions predominate 70% of the time while warmer interglacial conditions occur about 30% of the 100,000 years. This entire cycle has repeated four times over the past 400,000 years. The glacial cycle and occurrence of interglacial warm periods are commonly accepted as being influenced by the Milankovitch astronomical processes. Figure 1: The climate framework using EPICA Dome C ice core temperature proxies. 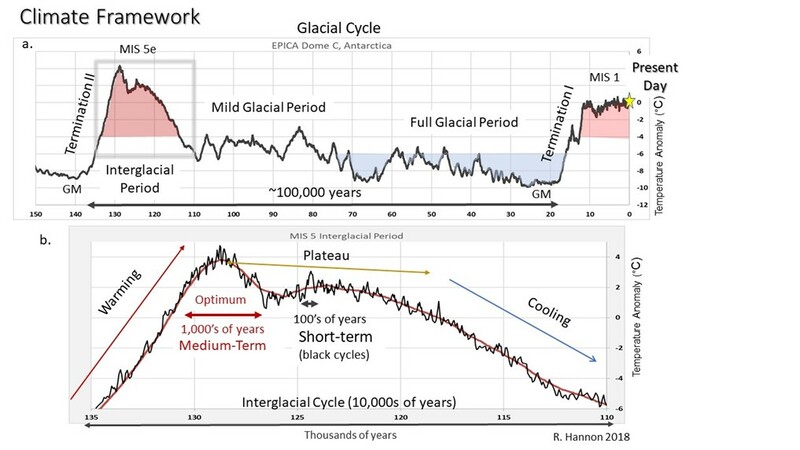 a) a glacial cycle over 100,000 years with warm interglacial periods in red and the long glacial period in between. Termination events and onset of the interglacial period are labeled. GM refers to glacial maximum. b) zoom in of the interglacial period (MIS 5e). Each interglacial period consists of a warming, plateau, and cooling segment, medium term events such as climate optimums and intervening cool events, and the smallest detectable climate variations in black that last only hundreds of years. The glacial and interglacial periods are very different climate cycles and are composed of different patterns and events. The interglacial framework and short-term events superimposed on all segments of the interglacial period are examined below. There are approximately five interglacial periods ranging in duration from ten to thirty thousand years during the past 500,000 years. The marine isotope stage (MIS) terminology is used in this post. Figure 2 shows the correlation of four of the interglacial warm periods. MIS 7e was omitted from this correlation due to its unique and unusual character of several short interglacial periods. Further discussion of MIS 7e can be found here. The entire cycle for the interglacial warm period is defined from the glacial maximum to the next significant low temperature minimum. This cycle is subdivided into warming onset, plateau, and cooling segments. Figure 2 shows the systematic and repeatable sequence of these three segments. Figure 2: Correlation of interglacial warm periods over the past 400,000 years. Present day HadCrut data is shown in red on the Holocene MIS 1 temperature proxy curve. Three key segments are highlighted; red is the onset warming, yellow is the interglacial plateau, and blue is interglacial cooling. Multi-millennial events are labeled as optimum, Younger Dryas (YD), 8.2 kyr event, and corresponding intervening cool events in past interglacial periods. Dansgaard-Oeschger (D-O) events are labeled and are mostly associated with the glacial period. Note the high frequency temperature fluctuations superimposed on the various segments of all interglacial periods. Amplitude and Duration: The most significant events are terminations of the glacial period and rapid onset of global warming of the interglacial period. These events are frequently referred to as Terminations I-V. The interglacial warming onset shows the largest temperature increases of 5-7 degrees C globally and up to 12 degrees C in the Antarctic dome C data. This dramatic increase in temperature occurs rapidly over 5,000 to 7,000 years as glacial sheets begin to decrease in size, sea levels rise and greenhouse gases increase. This warming process eventually reaches an interglacial optimum and plateau. The interglacial plateau shows variations in temperatures of approximately 1-4 degrees C and lasts from 10,000 to greater than 20,000 years. MIS 7e plateau was an exception lasting only 6,000 years. Earth is currently within the Holocene interglacial plateau that has lasted for more than 11,000 years so far. During this time, sea level is greater than minus 20 meters relative to present day and the Northern Hemisphere (NH) is predominantly ice free except for the Greenland ice sheet (Berger et. al). The interglacial plateau is followed by global cooling of 4-6 degrees C and up to 8 degrees C in the Antarctic data that takes 7,000 to 13,000 years to re-enter the next glacial period. Many scientists propose that decreasing obliquity, or Earth’s tilt, is responsible for initiating the cooling tipping point. The initiation and growth of ice sheets occurs, ocean temperatures begin to cool, sea level falls and greenhouse gases gradually decline during global cooling. Rate of Change: The temperature rate of change was determined for the warming onset, plateau and cooling segments of the interglacial period. Trendlines are calculated using the linear regression analyses by the “least squares” method shown in Figure 3. Figure 3: MIS 5e as an example for establishing trends and rate of change for the interglacial period segments. The warming and cooling trends have a strong correlation coefficient (R2), whereas the plateau tends to have a lower R2. 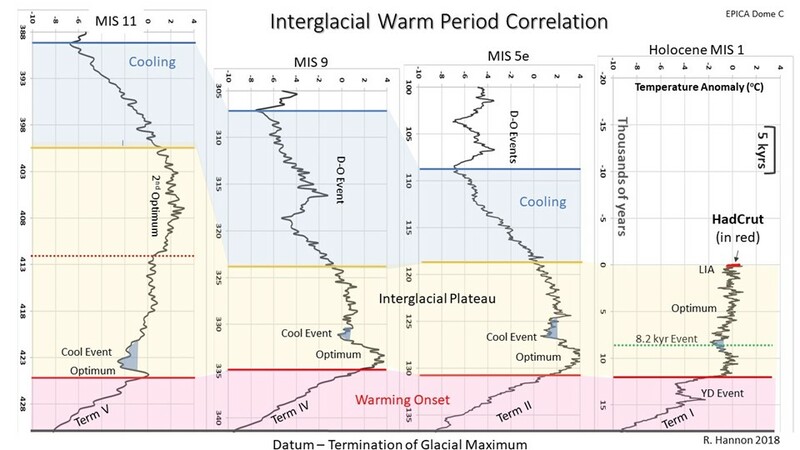 Figure 4 compares trendlines for each warming onset, plateau and cooling segment of the five interglacial periods. Note duration is in years. The starting points are pinned at zero, except for the global warming phase which was pinned at minus 10 degrees C. These simple trendlines provide visualization of the underlying long-term interglacial trends and removes medium and short-term internal variations as well as noise. Figure 4: Rate of change or trendlines for the past five interglacial segments from EPICA Dome C temperature proxies. Initial starting points are pinned at zero except for the global warming trendline which is pinned at -10 degrees C. The length of the trendline approximates the duration of the interglacial segment. a) rate of change for the interglacial plateau segments. Marcott and May’s Holocene global reconstructions are included. b) rate of change for warm onsets also referred to as Terminations and c) rate of change for interglacial cooling segments. Interglacial trends over the past 400,000 years exhibit steep warming onsets, slower cooling rates and nearly flat plateaus. Average warming onset rate of change is approximately 2.0 degrees C/millennium in the Antarctic with exceptionally strong correlation coefficients of 0.98. Average plateau rate of change is minus 0.01 degrees C/millennium (excludes MIS 7e) with weaker correlation coefficient of about 0.5. Interglacial cooling is less than 1.0 degree C/millennium with strong correlation coefficients of 0.95. Since the warming rate is twice as fast as the interglacial cooling rate, the typical interglacial period has an asymmetrical pattern suggesting Earth heats up due to natural processes more rapidly than when it cools. During the interglacial plateau, trendlines are relatively flat. MIS 5e, 7e, and 9 have an early and strong climate optimum which resulted in an overall cooling trend for the plateau. The Holocene MIS 1 global temperature reconstructions over the past 11,000 years by Marcott and May show a slight overall cooling trend compared to the Antarctic Dome C MIS 1 temperature proxy. MIS 11 which has the longest plateau shows a slight warming trend due to a later second climate optimum. The warming onsets are very consistent for MIS 5e and 9 as the trendlines practically overlie each other. MIS 7e has a rapid onset and a very short plateau, if any. MIS 11 has the slowest warming onset rate. The Holocene’s warming onset started out like MIS 5e and 9 but was interrupted by the Younger Dryas (YD) cooling event. Interestingly, the most consistent trendlines are the interglacial cooling rates which demonstrate a narrow deviation for the past four interglacial periods. MIS 9 cooling trend was measured up to a stadial event which is why it appears shorter. Interglacial cooling rates demonstrate consistent, predictable trendlines suggesting Earth’s climate follows similar, repeatable processes such as ice growth rates and oceanic/atmospheric process interactions as it cools. If Earth continues harmoniously in step with natural processes, the next significant tipping point will be the Holocene interglacial cooling. Scientists generally agree the Earth has been cooling over the past several thousand years at an average global rate of -0.20 degrees C/millennium. An interesting paper by Stenni et. al. incorporated seven different Antarctic ice core regions consisting of 112 records and used four different reconstruction methods. They observed a Holocene cooling trend in the Antarctic of -0.26 to -0.40 degrees C/millennium for the past 1900 years prior to present day warming of the most recent 200 years. Figure 5 compares these recent trends to the past interglacial cooling trends. 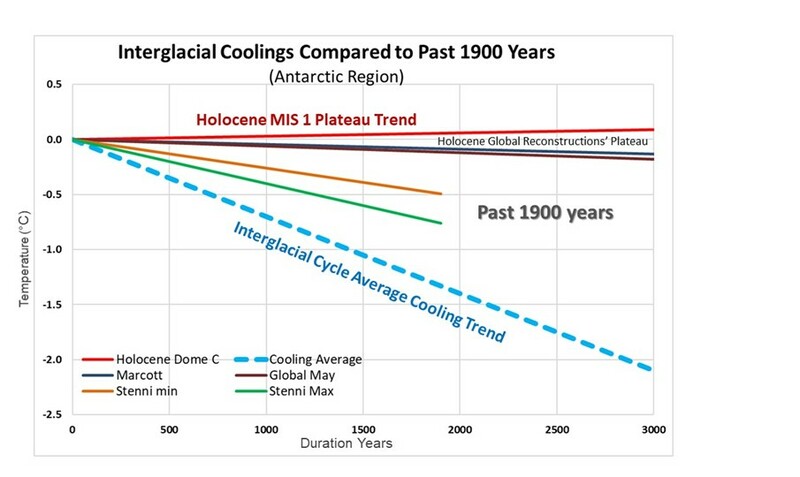 Figure 5: Comparison of the rate of change or trend for the past 1900 years bracketed by the Holocene plateau trend and average interglacial cooling trend. The Holocene plateau and cooling trends are from EPICA Dome C temperature proxies and the past 1900-year trends are from Stenni’s Antarctic region reconstructions. Initial starting points are pinned at zero and projected out in time. 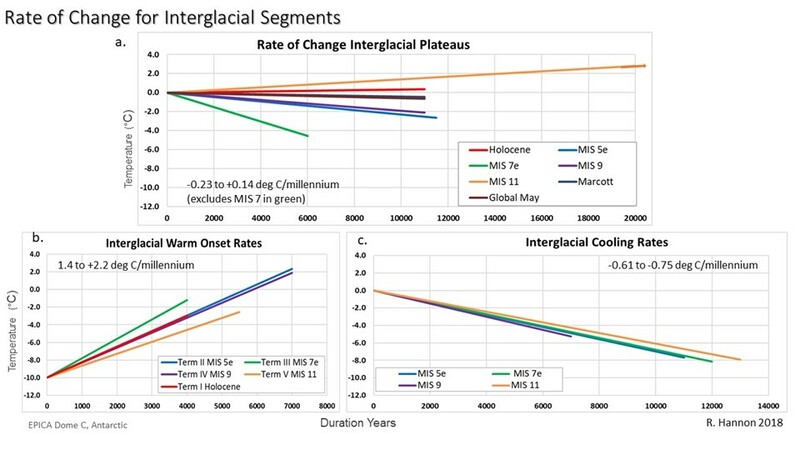 Marcott and May’s Holocene global reconstructions for the interglacial plateaus trendlines are included for comparison. It appears the past millennia Holocene cooling trends in the Antarctic are approximately half way between the 11,000-year Holocene plateau trend and approaching global cooling trends of the past four interglacial cycles. The average interglacial cooling trend from the Dome C data is approximately 0.7 degrees C/millennium and represents the next climate change tipping point. Understanding short-term cycles is important. Unfortunately, they are not well defined on the ice core temperature proxies due to resolution difficulties and local latitude differences. Short-term events within the Holocene interglacial period include the Medieval Warm Period (MWP), Roman Warm Period (RWP), Little Ice Age (LIA), and other cool events such as 4.2, 5.9, 7.2 and 8.2 kyr events. Some of these events are not as obvious on the Dome C data. However, they are more pronounced on northern latitude ice core temperature proxies. Global temperature reconstructions also tend to dampen the amplitude of these smaller events. Davis, et. al conducted an extensive study on the Vostok ice core data examining centennial events. This study concluded the sample resolution of the Vostok ice core data can detect centennial scale cycles. However, it is inadequate to detect decadal scale cycles. Spectrum frequency analyses over the past 12,000 years show centennial scale events on four different Antarctic temperature proxy records at 193, 318, 379 and 493 years. Several figures from Davis’ study are compiled in Figure 6. Figure 6: a) spectral power density periodogram of Vostok temperature-proxy records over the Holocene for 12,000 years showing six peaks. b) example correlation of the centennial peaks and troughs over four isotope records; Vostok, EPIC Dome C (EDC), EPIC Dronning Maud Land (EDML), and Talos Dome (TD). c) table showing the statistics for the TOc350 cycles with the present day HadCrut and UAHv6 statistics in red. Interestingly, Holocene temperature peaks in the above periodogram are similar to Holocene solar peaks in the Lomb-Scargle periodogram shown in Javier’s figure 62a. The de Vries cycle is approximately 208 years and the Eddy cycle is approximately 970 years. Davis has attributed the broad 1000-year peak to the Bond cycle. 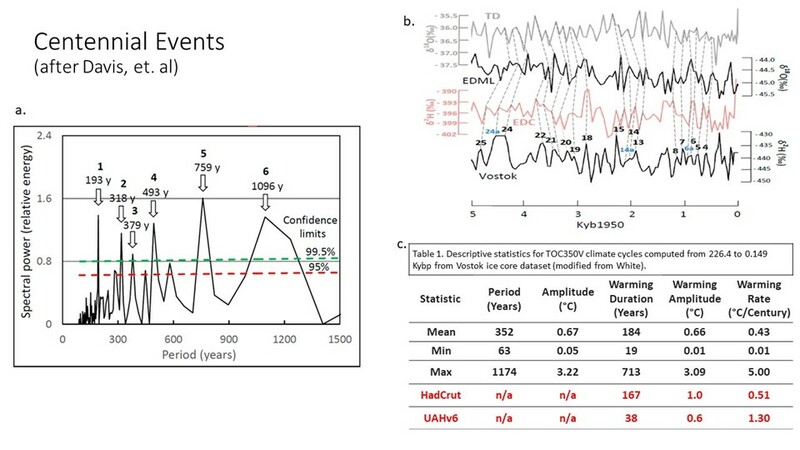 Amplitude and Duration: Davis identified 650 individual cycles of Temperature-proxy Oscillation (TO-c350) cycles in the Vostok data over the past 220,000 years. At least 60 occurred within the Holocene that are correlative over four Antarctic ice records with an example shown in Figure 6b. The TO-c350 events show temperature amplitude averages of 0.7 degrees C and an average cycle duration of 350 years. Davis speculates these cycles are the result of oceanic oscillations which frequently operate on a centennial scale bases. Rate of Change: These centennial cycles tend to have steep warming trends, or segments, followed by steep cooling segments. Warming and cooling rates are rapid averaging 0.43 degrees or more per century. They have a high frequency of occurrence, rise and fall within hundreds of years and are highly variable. These short-term events have a rapid peak turnaround in temperatures and lack a plateau or have an extremely brief plateau lasting several decades at most. Modern instrumental temperatures and warming rates are added to the table in Figure 6c. Their significance is discussed below. 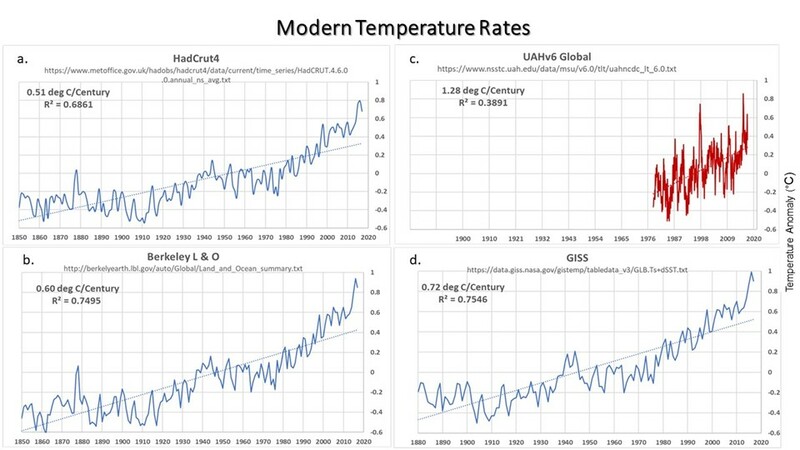 Recent temperature measurements over the past 165+ years based on satellite, marine and land instruments obtained and analyzed by HadCrut, GISS, and Berkeley indicate global temperatures have increased by approximately 1 degree C shown on Figure 7. This calculates into warming rates of 0.5 degrees C to 0.7 degrees C per century. The southern hemisphere trend for HadCrut shows a slightly lower trend of 0.47 degrees C per century. In the past 38 years, global average lower tropospheric temperature (TLT) anomalies show trends up to 1.3 degrees C per century from UAH datasets compiled by Spencer and Christy. This steeper trend can also be seen on the HadCrut, GISS and Berkeley plots from 1976 to present. Figure 7: a, b d) plots of global temperature in degrees C since 1850 from Hadcrut, GISS, and Berkeley combined land and ocean datasets. Rate of change per Century and correlation coefficient shown on each plot. 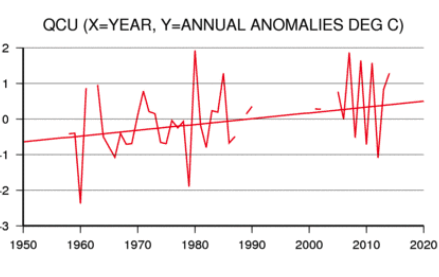 c) UAH global temperatures from TLT are from 1976 to present day, a much shorter period and shows the highest rate of change. The instrumental data is a good example of how “…trends for short periods are uncertain and very sensitive to the start and end years…” as noted by the IPCC WG1AR5. As an example, since 1980 to present day, instrumental temperatures show an overall warming trend of 1.8 degrees C per century (Berkeley). The timeframe of instrumental records needs to be mentioned. Recent instrumental data spans 165+ years during the past 11,000+ years of the Holocene interglacial warm period as shown on figure 2. Instrumental records represent a very small subset (1.4%) of the Holocene interglacial plateau and a tiny blip in geologic time. By establishing natural trendlines for different levels of climate temperature oscillations it is possible to improve our understanding of how the past 165 years have deviated from the natural baseline. While ice core proxies and instrumental temperature measurements are different datasets, general characteristics and trends of climate oscillations do exist. Comparisons may not be quantitative, however qualitative trends and observations are frequently used with imperfect data to develop scientific hypotheses that can be tested. Once a natural short-term climate variation from the natural paleoclimate baseline is established, only then can the potential Anthropogenic influence be further investigated. 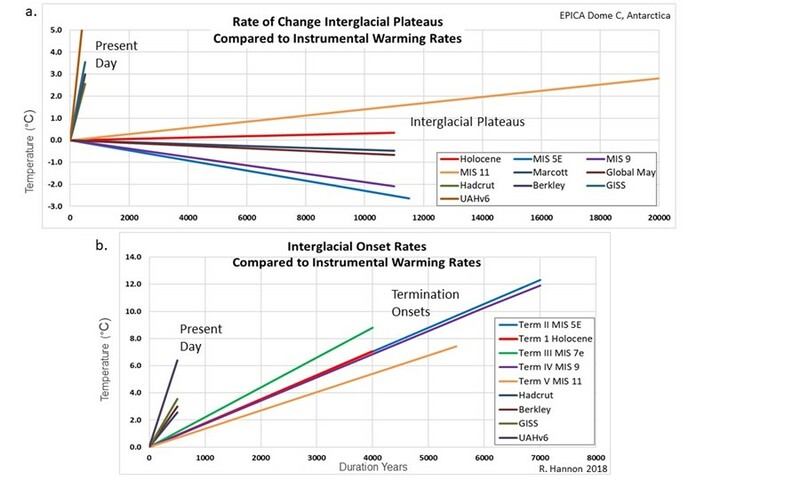 Rate of Change: By comparing instrumental rate of change to the interglacial plateaus shown in Figure 8a, there is a significant difference in trendlines. Instrumental trends have much steeper slopes (0.6 degrees C/century) than the flat longer-term interglacial plateau (0.001 degrees C/century or 0.01 degrees C/millennium). Projecting the 165-year instrumental trends suggests within 500 years temperatures will reach 2.5 to 3.5 degrees C warmer than present day. Figure 8a demonstrates and amplifies the conundrum of the recent warming trend compared to long-term trends and to reconstructions. This was illustrated quite nicely by the “Mann hockey stick”. Reconstructions tend to dampen the short-term amplitudes. Marcott states that his reconstruction preserves variability for periods longer than 2000 years, only 50% at 1000-year periods, and no variability less than 300 years. Figure 8: Comparison of modern warming trends with interglacial long-term trends. Starting points are pinned at zero temperatures and zero timeframe for the duration. Instrumental trends are projected for 500 years. Interglacial trendlines projections approximate their duration. a) present day warming trends and interglacial plateau trends. MIS 7e is omitted in the plot. May and Marcott’s global reconstructions rates are included. b) Comparison of instrumental trends with past Termination warming onset trends. Comparing instrumental warming trends to the Termination onset warming slopes shown in figure 8b is highly informative. Terminations I through V are significant paleoclimate events where the termination of the glacial state occurs, and Earth begins to change into a warm interglacial state. These long-term trends show the largest increase in temperatures of any paleoclimate event during the past millions of years. Importantly, present day slopes are much steeper than the interglacial warm onsets even on the polar Antarctic datasets. Here, modern warming trend is compared to both shorter-term events as well as long-term interglacial trends. Figure 9 compares absolute warming and cooling tends against their durations for various scales. Included in the plot are the interglacial only events from the Vostok TOc350 dataset by Davis, slopes for the past 100 and 1900 years from the Antarctic region by Stenni et. al., and trends calculated for Dome C interglacial segments discussed in earlier in this post. Figure 9: Plot of rate of change in degrees C/century and duration for individual warming, cooling and duration segments. Black dots are instrumental Berkley and UAHv6 rate of change. Blue dots are interglacial segments calcuated by this author, orange dots are Holocene warming rates from Davis, TOc350. Green octagons are from the Antarctica region for 100 and 1900 year durations by Stenni. Decadal data cannot be extracted from ice core temperature proxies and is missing from this plot. Instrumental data (black dots) are plotted using both the 38-year rate of change of 1.3 degrees C/century and the 165-year rate of change of 0.6 degrees C/century. Figure 9 shows two distinct classifications; one group is less than +/-500 years of duration and the other is greater than +/-700 years. The group with less than 500+/- years duration are predominately short-term warming and cooling segments. They typically don’t have a plateau long enough to establish a trend. Warming and cooling rates range from 0.01 to >3.0 degrees per century. Interestingly, the small-scale events which have the shortest duration and smallest temperature amplitude tend to have the steepest trendlines. This is also visibly noted on Figure 1b where the black short-term oscillations are superimposed on all segments of the interglacial period underlying long-term cycle in red. The long-term interglacial segments demonstrate a clear and distinct second group. Warming, cooling and plateau segments that last longer than 700+/- years consistently have rates of less than approximately 0.25 degrees per century. This includes the geologically significant Termination onsets. These long-term events also exhibit the largest temperature ranges up to 12 degrees C in the Antarctica and Greenland data. Although the above definitions are qualitative in nature, Figure 9 distinguishes climate change from climate variability. As more data on multi-centennial events becomes available in the future it will help narrow the range. For now, multi-centennial warming and cooling trends less than +/-500 years in duration can have a wide variance in rates of change. However, warming and cooling trends greater than +/-700 years in duration which are the underlying long-term trends have rates of change less than approximately 0.25 degrees C per century based on Antarctic data. These are true climate change events. Climate variability best describes the shorter multi-centennial trends which are merely the overprinting internal oscillations on longer-term climate change. Currently, instrumental temperature characteristics are consistent with natural climate variability of short-term events and steep warming trendlines. Scientists studying climate change should entertain multiple working hypotheses. We’re all familiar with the CO2 hockey stick with ever increasing global temperature projections into the 21st century. Past natural climate characteristics suggest another hypothesis. One that Modern Global Warming is part of a natural warming segment of multi-centennial climate variability and the impact of CO2 is overestimated. The modern high rates of change are certainly in line with past natural short duration events. And in a couple of centuries, there may be a quick turnaround at its peak (no to minor plateau) and then a cooling multi-centennial segment will ensue. Every several centuries Earth will experience these false alarms of high rates of temperature changes both positive and negative. Recognition of short-term cycles and resulting adaptation strategies should be different than for longer-term climate change. These multi-centennial cycles of climate variability will continue over the next several millennia until the true underlying Holocene interglacial long-term cooling begins to take Earth back into the next glacial period. Characteristics in paleoclimate data occurring prior to industrial revolution cannot, by definition, be attributed to anthropogenic forcing. Paleoclimate data can establish a natural baseline for long, medium, and short-term climate cycles. The Holocene and past interglacial plateaus are characterized by high frequency multi-centennial climate variability that has different characteristics than the underlying longer-term multi-millennial climate change. Climate Change tipping points and underlying long-term framework are the interglacial onset, plateau, and eventual cooling. These cycles demonstrate dramatic temperature changes of up to 12 degrees C. The next natural long-term tipping point for Earth will be a cooling at the end of the Holocene interglacial period. It will take thousands of years for Earth to enter and progress through this phase, providing Earth along with its ecosystems and inhabitants time to adapt as necessary. Climate variability has a high frequency of occurrence, short durations of less than about 500 years and can demonstrate warming and cooling rates greater than 0.25 degrees C/century. Currently, instrumental and satellite temperature data exhibit rates of 0.5 to 1.8 degrees per century that are well within the assemblage of natural centennial events. Therefore, present modern warming is likely a natural multi-centennial warming segment that will soon begin a temperature turnaround. This post compared modern instrumental trends to paleoclimate trends. The comparison reveals present day warming is not consistent with rates of change (temperature) observed in long-term climate change. The rate of change for modern warming is consistent with climate variability. Acknowledgements: Special thanks to Andy May and Donald Ince for reviewing and editing this article. March 28, 2018 in Climate News, Paleoclimatology. I think this slight warming trend we have had is now in the process of ending. Again I think year 2018 is the turn year. The warming that did occur was not unique. Overall ocean sea surface temperatures are now in a down trend ,this if it continues will end the recent rise in global temperatures. Yes the climate can change and does change abruptly at times. Why end in 2018 and not, for example, 2021? What’s the rationale? Round here we can get warming/cooling rates exceeding 0.5 degrees C/hour. I believe this not unique to South London. Adaptation can be observed, with the natives – like me [OK – an incomer a quarter of a century ago] – wearing significantly more layers at 0600 Local Time, than at 1400 Local Time. Again, not unique to South London. How can you compare global trends with trends for the Arctic / Antarctic? What would it look like if you compared like for like? Could you provide a link to this TOc350 data used? The only data I could find data for Vostok ice core gave it in 100 year increments. How can you compare global trends with trends for the Arctic/Antarctic? What would it look like if you compared like for like? The southern hemisphere trend for HadCrut shows a slightly lower trend of 0.47 degrees per century, still steep. Marine ice core data shows much lower trend lines for the warming onset (0.3 to 0.6 per thousand years). If you correct the Antarctic data to reflect a global trend, it would also show the trends to be lower or approximately half. In summary, global ice core data trendlines on the warming and cooling segments are significantly less than the modern warming trend. Could you provide a link to this TOc350 data used? I used the supplementary table provided in Davis’ article. The following are available online at http://www.mdpi.com/2225-1154/6/1/3/s1. Thanks for the link. I’d just found it myself and posted a comment, but as it often takes some time for my comments to appear this thread might get confusing. According to the supplement, the sampling frequency is “six to 24 per Ky”. So even at the highest resolution there can only be a couple of data points per century. This suggests to me that all the trends calculated over a hundred years or less are dubious, and really cannot be compared with the global instrument temperatures based on annual data. To answer my second question, I think the TOc350 data is from this paper. This is identifying a 350 year cycle called TOc350V. But my question is, how valid it is it to compare trends based on annual data with data that can only have a few data points a century? how valid is it to compare trends based on annual data with data that can only have a few data points a century? I mention in the post that comparing modern instrumental data to ice core data is not straightforward. Therefore, I compared segment trends instead of individual data points. And yes, instrumental data is only measuring one segment so far, a warming trend. Therefore, I compared segment trends instead of individual data points. And yes, instrumental data is only measuring one segment so far, a warming trend. I’m still confused by this. In Figure 9 you show trends for instrument temperatures, based on UAH6 and BEST. You say the 38 year trend is only 1.3 C / century. (I assume you are ignoring BEST at this point which would be 1.8 C / century), and the 168 year trend from BEST of 0.6C / century. I assume these trends are based on least square regressions, using annual or monthly data. But you are comparing these to trends from ice core data which are at best data points every 40 – 50 years. You say these are “segment trends”, not individual data points, but I’m not sure what you mean by that. Are you measuring a rate of change using just two data points, that is, taking the difference between two adjacent points and dividing by the time between them? If that is the case than it isn’t a fair comparison, the instrument data is smoothed over many data points, the ice core data is just measuring noise. Yes, I used the UAH6 data for the 38 year trend of 1.3 C/century. I also acknowledge the steeper trend of 1.8 C/century since 1980 to present day that can be seen on the HadCrut, GISS, and Berkeley data. They are based on least square regressions, using annual data. The Dome C temperature proxies for the warming, cooling, and plateau trends are also based on least square regressions. If that is the case than it isn’t a fair comparison, the instrument data is smoothed over many data points, the ice core data is just measuring noise. But my question is, how valid it is it to compare trends based on annual data with data that can only have a few data points a century? I think this is the key question, and it wasn’t answered. In Fig 9, dots of rates of change at individual locations are mixed in with black global averages. This is not like with like. Locations are much more changeable than the global average. In Fig 9, dots of rates of change at individual locations are mixed in with black global averages. This is not like with like. Nick, I changed the black dots from global instrumental trends to HadCrut southern hemisphere trends. The 38 year trend is now 1.0 C/century instead of 1.3. The 165 year trend is now 0.47 C/century instead of 0.6. Therefore, all the data is now consistent. I also highlighted the marine isotope warming onset trends which are more representative of global temperatures for comparison. The conclusions are the same, modern instrumental data from the Southern Hemisphere has much steeper trendlines consistent with climate variability. Nick, there is no Arctic data included. The plot with Southern Hemisphere Hadcrut and Antarctic data is shown below. It must be a bit frustrating for anthropogenic forces to see their ranking in figure 9 or in the figure above. Still a low ranking after all the human input! Even if combined with the results of natural forces, the results of the anthropogenic era are weaker than shown by many ‘only natural forces’ events that are ranking higher. But this still misses the point. Globe or hemisphere averages mix in a great range of different happenings. Ocean, land, polar etc. Some go up, some down, and the average is much less mobile. A single location, like Vostok, is much more mobile, and will show much greater rates of change, up and down. Whatever the climate is doing. It ranges over about 4 degrees, while your plots of HADCRUT vary by about 1 degree over that period. There’s also polar amplification to consider, and the fact that the southern hemisphere is warming slower than the north. UAH6 shows almost no change over the south pole, but warming twice as fast as the global average at the north pole. But I’m also questioning how valid a trend is if it’s only based on two data points. Nick, please read Davis’ article. The Vostok ice core data is correlated to 4 Antarctic ice core proxies noted in Figure 6 (Vostok, Dome C, Maud Land, and Talus Dome). Pretty impressive. Does the Hadcrut Southern Hemisphere instrumental data only include the Vostok data shown in your plot? I had assumed it averaged multiple land and ocean data in the area. Of course it does, and that is the point, which you seem absolutely unable to grasp. The issue isn’t whether Vostok is correlated with whatever; it is whether its range of variation can fairly be compared with that of a global average, as you do. And it can’t. The number of data points for each centennial warming and cooling segment range from 2 to 9 per segment with an average of 3 or 4 per segment. Many of the segments that contain only 2 data points (highlighted in blue in Davis’ SM Table) are not used in the Figure 9 plot. Additionally, these oscillations were correlated to 3 other Antarctic ice cores as I mentioned earlier, indicating they are not unique events to just the Vostok area. Of course I understand modern instrumental data is much higher resolution. If you choose to ignore the ice core data centennial trends, that is up to you. However, there is no denying that the modern warming trend is much steeper than the underlying long term interglacial warm onset or cooling trends. Again the point is not so much whether these are accurate, but whether their variability can be compared with global averages. The uncertainty of a 3 or 4 point trend is huge, and just shows up as a big scatter of dots, as in Fig 9. WR: That is a question for a specialist. But it is well known that both the total quantity of ice on land (world wide) and regional temperatures influence the 18O content. 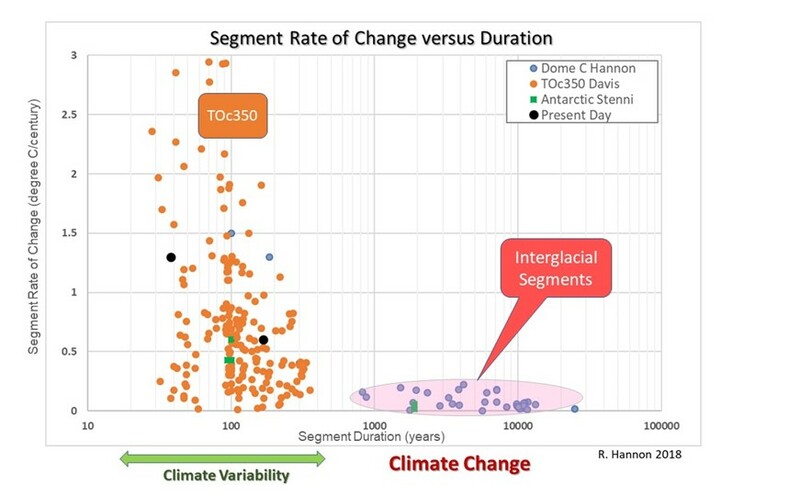 Nick, Ice core data demonstrates that centennial cycles exist and provide insight to their frequency and variable rate of change as demonstrated by figure 9. I don’t agree that you can just discard or ignore this data. Both have uncertainties and challenges as I have pointed out in the post. The number of data points for each centennial warming and cooling segment range from 2 to 9 per segment with an average of 3 or 4 per segment. OK, I think I get what you are doing now. You are looking at each cycle and measuring the distance from trough to peak. Am I right? Nick, one more point to make is the study by Stenni shown in green on Figure 9 collaborates both the longer term flat trend lines and the short-term 100-year steeper trendline. Stenni incorporated seven different Antarctic ice core regions consisting of 112 records and used four different reconstruction methods. That’s 3 datasets all pointing towards a similar observation. For the Davis TOc350 cycles, the warming and cooling rate of change and their durations are calculated from the trough to the peak and from the peak to the trough of each cycle, respectively. The first part, to paraphrase, 0.25 is nearly as much as 0.5, is a hopeful estimate. The ‘therefore’ part just doesn’t follow. Why it would be likely? Possible, yes, if there were no other knowledge on reasons of the variation. Since we have knowledge, that has to be taken into account before saying anything on likelynesses. I find it possible that the warming since 1950 is totally anthropogenic. This is what IPCC says, with strong words. I don’t think the ‘observed’ warming is necessarily completely real, as it has been fixed so many times, but I still find it possible, that the anthropogenic part is as large as the real warming. Mods forgive my quote mistake. By using past temperature proxies, one can establish the natural variability of short-term and longer term climate fluctuations due to astronomical, oceanic, and atmospheric influences which indeed is complex. This post is demonstrating that modern warming is within those natural bounds. By understanding and incorporating natural trends, then the influence of GHG on top of those can be addressed. Anthropogenic GHG may be influencing or amplifying the current warming trend, it certainly is not controlling all of it. I understand this, but the conclusion still does not follow. I’d put it another way — attributing the recent temperature rise to CO2 only is rather streched but also difficult to exclude. The shape of the post 1950 surface record is consistent with a significant CO2 warming, but proving its share is a completely different thing. Great article! Your figure 9 is a pretty compelling argument that current short term variability as observed from modern thermometer and satellite observations sits well within natural variability of short scale fluctuations as estimated from ice cores. Warmists cannot hear you, as they have their fingers in their ears, and are saying “lalalalalalalala!” Warmism is a new type of mental illness. Yep. Been sayin it and sayin it. But not even 1/100 as good as this article. Best article eva! Unfortunately it will soon be co-opted by solarists ad infinitum ad nauseam. Yes, I read that small mention. It shows the author doesn’t oppose a solar interpretation, so you can hardly argue about others co-opting the article. it is more you the one that is co-opting it to anti-solar bickering. Given the close correspondence between multi-centennial temperature trends frequencies and solar variability frequencies, and given the known effects from past Bray solar cycle lows, I place the tipping point possibly in ~2000 years but with highest probability in ~4500 years. That’s when the Holocene should end. In my opinion the tipping point, clearly visible in past interglacials as you show, and that greatly increases the cooling rate, is caused by a great expansion in the cryosphere during a low in the Bray cycle that triggers a strong albedo feedback that prevents the melt back. From that point ice sheets start growing and there is no turning back. The Little Ice Age was close, but didn’t reach the tipping point. The weight of the ice sheets also causes an increase in volcanic activity that contributes to the enhanced cooling. The correspondence between climate variability and solar variability over the Holocene deserves a better attempt at explanation than simple arm waving and flat out rejection. If that were true one would expect volcanism to increase closer to ice sheets – don’t know of any studies demonstrating that. You may be conflating the work of Tolstoy who argues convincingly that submarine volcanism is greater during marine lowstands when ocean water is removed and fixed as continental ice sheets. She argues the lower weight of water pressure over mid-ocean ridge systems results in increased volcanism rates. The difference there is as sea level is a global effect and volcanism is likewise widely distributed. Javier, I’m glad you enjoyed the article. I concur that the Holocene warm interglacial period will slowly end in the next several thousand years due to continued decreasing obliquity and other solar cycle lows triggering subsequent oceanic/atmospheric responses. Hopefully, we can survive through these annoying high frequency centennial events with minimal impact/expenditures. Can I ask the author if CO2 data is available to align with 4 segments of Figure 2? CO2 always increases in response to a warming wetter world and always decreases in a colder dryer world. The mechanism for such a response is a simple one and easily demonstrated under lab conditions. Yes, there is CO2 data available. Basically, it increases during the interglacial periods and is minimal during the glacial periods. It decreases during the cooling period but with a lag time of centuries. I have no confidence at all in the instrument period data as represented by HadCRU, NOAA or GISS. The continual adjustments to historic data. the homogenisation process, the deterioration of the met stations and the failure to deal properly with UIHE among other questionable manipulations means this data has no place in the scientific literature. The analyses of temperature records presented before 2000 were probably far more accurate that what we are given today. Temperature records from individual stations or localities show a vastly different picture from that presented by GISS et al. Any graph that presents the present as being warmer than late 30’s early 40’s, or that shows present temperatures as being similar to the medieval/ Roman warm periods lacks credibility. I say this based on known historic factors such as vegetation growth records e.g. grape or crop growing. Similarly, ice data such as the recent ice retreat uncovering tree stumps in Alaska that were dated at 1000 and 2000 years ago show forests grew there then where they cannot grow today. The scientific literature is full of such comparisons that give the lie to the exagerated claims of GISS et al. So why use this data. I know there are difficulties but the comparisons with older proxies should surely be what that same proxy from the same location shows today. Instead we repeatedly see recent temperature records being added onto proxy data as a continuum. I agree. GISS, HADCRUT, and NOAA have been stepped on enough that drawing any conclusions from them is difficult, beyond the fact that they have been stepped on. There is a good deal of noise and other natural variability that finding any connection with GHGs or solar is difficult. I agree and it’s unfortunate instrumental data has been stepped on by correcting to various baselines. Uncorrected instrumental data may show less warming, a flatter trend line and reduce alarmists’ concerns. What we need to look for are the underlying trends less than 0.25 degrees C/century. Otherwise, modern warming and short-term steep trends still fall into the centennial climate variability classification. My concern was more that the temperatures in the US in the 1930’s were reduced, and temperatures in Australia in the late 1800’s and early 1900’s were reduced, making a purported correlation with CO2 stronger. Here is the real question. Is temperature directly corresponding to the heat content? If not, why is everyone so concerned about temperature? Shouldn’t we be more concerned about the heat content averages over the globe? How do we go about determining that? Ask yourself if heat content can go up but the temperature remain the same? Boy, I must have been half asleep when I wrote this. What I should have questioned is this. Does temperature directly correspond to the heat content of the local atmosphere it is measuring? Is there another variable you must also know in order to know the heat content? If another variable is needed then all the attention paid to temperature data sets, their averaging, development of CGMs, etc. is worthless unless you can also calculate the heat content associated with a “global temperature”. Given the current interglacial plateau we are on, the presence or not of warming/cooling on multiple decadal or less timescales seems trivial matter to me. I would expect sensors to demonstrate warming here and there, at the same time other sensors demonstrate cooling there and here, while others are flat. To argue on either side or to impugn or not any or all fine scale data series also seems trivial matter. The larger swings, of which we are currently and pleasantly riding on, speaks and points to natural intrinsic causes and teleconnections, in the large and small swings and jiggles. While the author makes small mention of solar data does not by itself mean there is a viable solar theory. And so far, I have not read of any. In the Edmonton area we’re heading back into the deep freeze. With snow and temperatures running about 8 degrees C below normal, right into the first part of next week. It would be hard to convince anyone in Alberta this year that temperatures are warming. Or most of all that winters are getting shorter, which you would expect to see with global warming. I must point out that the difference between climate variability and climate change is subjective. Any chance to have that excellent piece published in a so-called peer reviewed journal? That’s worth a try. Speaking of the instrumental record, the CET exhibits rapid short term rates of warming and cooling such as the rapid warming for about 40 years beginning just before 1700. If climate scientists do not know what caused that, how can they claim certainty that recent warming was not caused by the same thing? A 1660 AD to 1720 AD ‘hockey stick’…… very interesting! Great post Renee! The geological perspective of climate change once again buries AGW in the noise level. Excellent review of the paleoclimate baseline for understanding the inexorable major trends and for understanding the much more volatile short term trends of a few centuries. The majority of strong warming proponents appear not to understand the obvious effect of different granularities in terms of data resolution or, in some cases choose not to. Marcott at al were led by the data to conclude that today we are warmer than at any time in the the past 800,000yrs, until Steve McIntyre pointed out to him the smoothing effect of multi- century data points and which forced him to emend his comments to say his statement wasn’t supported by the data. Michael Mann’s careful splicing of the instrumental record onto the last millennium proxy reconstruction to create the hockey stick, termed in a climategate email Mike’s Nature (journal) Trick, clearly demonstrates that he understood this to be a no-no. Others along with Mann argue that the MWP was slightly cooler than today, when the best way to understand it, because of granularity, is to at least average the last 150yrs of the instrumental period for a more reasonable comparison. The status quo climate scientists would appear to be a mix of neophytes with inadequate skills in science in general and purposeful deceivers to be kind to both types. Steve McIntyre is a mining engineer and statistician, and although his criticisms have resulted in retraction and revisions of major climate science papers and improvements in methods in dendroclimatology and removal of certain trees from paleoclimate data bases that don’t show temperature changes adequately (he even updated a series that resulted in rejection of this species as a proxy) his detractors say he’s not a climate scientist. Study of climate is heavily based on the one skill generally poorly understood and therefore ineffectually used by the status quo and that is a rigorous knowledge and understanding of statistics. The rest of it is simple stuff, easily digested by scientifically literate persons from all disciplines. A secondary weakness is chemistry which shows in work and experiments with ocean ‘acidification’ chemistry of the atmosphere, and facility with thermodynamics (heat engine earth, enthalpy- the hidden heat in phase change of water, etc). Greetings from the Big Mango (BKK). Thanks Renee, for interesting consolidation of variability vs change. Article at end suggests higher resolution coming. I believe this reference to Karin Labitzke’s work shows an undeniable solar connection to climate and weather. In a series of seminal articles Karin Labitzke with Harry van Loon (1987; 2006) established that the QBO modulates the effect of solar activity on the stratosphere and the Polar Vortex. With great insight Labitzke, who was aware of the state of the solar 11-year cycle through time, unlocked a problem that had occupied researchers for centuries when she decided to segregate the data on stratospheric polar temperatures according to QBO phase (Kerr, 1987; figure 96). The very low correlation when all the data is considered, becomes very high using the segregated data, and Labitzke became the first to identify a strong sunspot-weather correlation. Shows temp changes in 3 month resolution from a lake bed in west Ireland. After 80 yrs of vegetation die off, the lake froze at the beginning of Younger Dryas. Having early on in the previous decades dismissed the AGW theory I at first attributed temperature change to solar influence. After much reading and critique, I dismissed that theory almost 10 years ago. I now ascribe major and minor climate changes it intrinsic factors. The powerful influence of oceanic heat storage and release with its teleconnections to a swirling atmosphere simply overwhelm the minute energetic capacity of anthropogenic CO2 or tiny solar variations. Addendum. I consider Milanchovitch cycles to also be an intrinsic factor. Pamela, you don’t seem to understand it is the solar TSI variations that are driving the ocean heat content variations, as shown in the Figure 17 I posted below. You have been carrying on about the supposed tiny variations yet you shown no work. I just witnessed firsthand warmist scientists express your very opinion, and they were the ones unwilling to even reconsider what they think, just like you. Wrong Pamela. I was right in 2014 for the right reasons then as now. When are you going to get over it? Renee, visual relationships in data are important clues to follow up on numerically. Visually similar warming & cooling trend rates of HadSST3 were a starting point for me in understanding the impact of solar cycle evolution, the relationship of daily 1AU TSI to observed F10.7cm flux, and most importantly, on sea surface temperatures, HadSST3. Apply this concept to the past solar cycles since the Dalton, and appreciate warming spikes would have resulted in times of high enough solar activity, for a long enough duration, to affect linear and step changes in OHC accumulation, SST, SL, ice, etc, and conversely from sustained low to lower TSI. Our goldilocks climate is then defined as one bounded by changes in TSI, itself bounded by continuous solar cycle changes in the sun’s mean field, ie, the solar cycle influence. As long as sunspot activity is evident, changes in the mean field are occurring, pumping out TSI pulses that warm the tropical ocean. 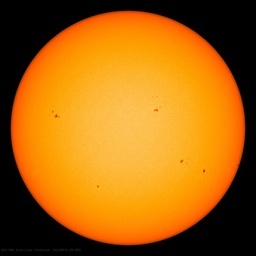 If it were possible for the sun to remain in a lowish state of sunspot activity for thousands or millions of years, ice ages would ensue. I happen to think it does that, although that’s a harder one to prove than recent solar warming. My 2014-15 solar work demonstrates when TSI is above a long-term ocean warming threshold level of 1361.25, ocean heat content accumulation really takes off. That number is equivalent to my original 2014 calculation in F10.7cm, @ 120 sfu. The 2015/16 El Nino was a top of solar cycle TSI driven event. Note the strong growth in OHC in the 2014 TSI peak and the early 2015 peak – all when TSI was solidly above my 1361.25 warming line, registered at the zero anomaly in OHC. Note the dark red bar is the day, March 14, 2016 when daily LASP SORCE TSI fell below this line, practically concurrent with the drop of OHC into the negative, and SSTs into cooling, confirming my 2014 solar warming/cooling concept, practically to the day! My study thus far of frost and snow/ice damage in agriculture is pretty clear: when TSI is below 1360.8, seasonal and regional crop failure events occur, it’s the low-TSI danger zone. 3. blazing May-October land temperatures due to high UV-index (high insolation) & less WV under low TSI. Climate and weather variability reduce down to solar cycle influences, one solar cycle at a time, whether that cycle be a 27 day solar, or 11 year solar, or quasi-100 or more year solar cycle. The sun operated in a higher TSI mode in the latter 20th century, driving the warmth, now declining. The climate changes when the sun changes. Bob Weber…I was sort of interested in what you were saying in your two comments (at least give it some further thought) about TSI affecting short/long term, weather/climate until you stated “My long-term theory is the sun falls into a low activity state insufficient for warming, producing ice ages.” Now I have to suspect every thing you wrote about TSI affecting weather and climate change, since your ‘theory’ on what causes ice ages is not true and isn’t even a hypothesis by mainstream science, from any side of any debate. Come back to earth ling2. What I said about ice ages was speculative, and my solar-terrestrial work doesn’t depend on it at all. All theories regarding ice ages are theories only. I have a valid idea about ice ages, whether it’s true or not is yet to be determined, since no one knows for sure what causes ice ages as other concepts about it are still theories, including Milankovitch. Of course stating it that way invites further abuses right? The works of mine are recent solar climatic relationships that I successfully captured. The extension of the basic ideas is what I was getting at, and whether or not it’s important to ice ages, it is important to the more recent past, the present and the future. The Maunder minimum was a 70 year low solar activity period associated with difficult cold conditions regionally, seasonally, as we’ve started into now under a relatively much shorter term solar slowdown. The Dalton solar minimum was another such well-known short-term solar cooling period. The Medieval warm period was a time of higher than average solar activity. Make sense? People who don’t understand the present stand no chance of understanding the past. The variations in the ice core records were obvious when they were published starting in the 1980’s- nearly 40 years ago. Since then new cores and methods have increased the resolution and. But it is strange that very few climate scientists have tried this approach to understanding what the record shows. It was obvious, even in a cursory examination that the seven ice ages on record have many similar characteristics- a very fast warm up over less than 1,000 years, now known to be as short as a couple hundred years- followed by an immediate gradual falling off in temperature, interrupted by many small abrupt up and down changes, for 7-20,000+ years back down to the same base level. Renee Hannon has done a very nice job quantifying the changes and graphing them in an effective manner. As a qualified peer reviewer this is way better than most climate science papers. The 2015/16 El Nino, Pacific Warm Pool, atmospheric rivers, and associated events occurred because the weather and climate are fundamentally reducible to daily TSI, as the results of my work show below. The ocean heat content accumulation had strong growth when TSI was above the warming line of 1361.25, and dropped below the zero anomaly line within days of daily TSI dropping below 1361.25 on March 14, 2016. My long-term theory is the sun falls into a low activity state insufficient for warming, producing ice ages. Nice big picture article. Permabookmarked for future reference. Greetings from the Big Mango (BKK). @ Bob Weber -a recent article on NoTrickZone shows a chart of German winters (DJF) from 1988, sc 22,23,34, trending down -0.0186 dgC per year, supporting your theme of cooling, probable Eddy Minimum. It should be obvious that there is no correlation between CO2 and global temperature, except that warmer oceans give up more of it to the air, so that its increase is an effect rather than a cause of warmth. CO2 has been rising steadily since the end of WWII. Yet for the first 32 years after 1945, earth cooled dramatically. Then in 1977, the PDO flipped and our planet enjoyed 20 years of warming. The accumulated heat was blown off during the super El Nino of 1998, after which, despite continued CO2 growth, earth’s temperature stayed the same or cooled slightly. Then came another super El Nino in 2016, and we’re now back to cooling. Nature has repeatedly shown false the hypothesis of man-made global warming. Greetings from the Big Mango (BKK). @Pamela Gray- my reading of the climate tea leaves says we’re already past the interglacial plateau. For the last three thousand years, Since 1000 BC, the end of the Minoan Warm Period, the global temperature trend has been -0.5 to -0.7 dgC per 1000 yrs, projecting full glacial of 8 dgC in another 7,000 yrs. Another clue, the obliquity dropped below 23.5 degrees around 1300 AD, the onset of the Wolf Minimum. So the Holocene Interglacial has been over for some time now. We are in the transition zone, expect Finoscandian ice sheets to start in 2000 yrs. However, the solar output has been declining since 1986 and this accelerated in 2009 with solar cycle 24, the lowest in 200 yrs. Cycle 25 will also be low and the beginning of a Grand Solar Minimum, now named the Eddy Minimum. Expect a Little Ice Age lasting 40 yrs, with some winters extremely cold, some wet cool springs to kill crops, some cold summers. This slide into cold is showing up in German weather station records where the last 30 yrs of winter (DJF) are trending -19 dgC per 1000 yrs, much faster than the slow decline to normal glacials. You’ve been warned. Take a sharpie and write your social security number or driver’s license on the inside of your arm, heh. Stock up on hatchets and hunting knives to trade for food. I don’t much care for the use of the term “tipping points” in the essay – it makes it sound more like a rabid warmist trying to push for instant action. Great article Renee, which brings together a lot of the meaningful recent data into a logical, easily readable story. Now if only we could work out what causes the massive change to the earth climate equilibrium system that flips the global climate from glacial to interglacial, and back more slowly – an asymmetrical equilibrium. I cant help thinking that the whole Anthropogenic Global Warming theory is meaningless until the natural earth system is worked out. i just hate those bogus surface temperature charts which present a false picture of the temperature record. Instead we should use Hansen’s 1999 surface temperature chart as being representative of the temperature profile of the entire Earth. This would give us a much clearer picture of what we are dealing with. As we can see from the chart, the warming from 1910 to 1934 was of equal magnitude to the warming from 1980 to 1998, and 1934 was hotter than 1998 and 2016, so we have actually been in a temperature downtrend since 1934. So what we see is that Mother Nature caused the climate to warm from 1910 to 1940, which means Mother Nature could also have produced all the warming from 1980 to the present, since they are of equal magnitudes. Just about all unmodified surface temperature charts from around the world resemble the temperature profile of the Hansen 1999 chart, which means all those areas experienced similar temperatures. None of the unmodified surface temperature charts from around the world resemble the Hockey Stick charts of HadCrut, Best, and the rest. Hockey stick charts are a lie perpetrated on the world. They present a false picture of reality. No they don’t, because there are no global temperatures (we have multiple globes now?). Graphs, we need more graphs, lots and lots more graphs. Yeah, that’ll explain everything you betcha. The envirohypocrites will all scream outrage and condescension, and their hated opposition will try to calm them down without any success. Great article, thank you. Can you point me to the data used to plot your orange points in Figure 9 please? i read through Davis and got the Table 1 from there with the statistical summary, but its not clear where the actual data file is archived. Is it just derived from the ice core data and if so, how do you reproduce it? Its ok Renee, I read back through the thread and found your link to the Supplemental Material. Yes, the supplemental table contains all the data. And I only plotted the centennial cycles during the Holocene and preceding interglacial period. One aspect of this discussion that may have been overlooked is the lag between the steps in the process. Warming such as the Holocene interglacial and not cooling, has been shown to bring increased Polar precipitation – heavy snow and thus ice thickening, while its converse brings drought. (https://www.nasa.gov/feature/goddard/nasa-study-mass-gains-of-antarctic-ice-sheet-greater-than-losses ); and when the ice volume and extent overhalls rate of melting (as in Eastern Antarctic), ice advances, oceans ‘shrink’, precipitation falls, eventually putting an end to accumulation of new snow and ice (in the Western Antarctic) . The surge of ice that characterises the Pleistocene glacial maxima, suddenly ends, as the conveyor belt has no more ice to bring, and the world enters a new warm period. Such a scenario (ice volume cycles lag accumulation cycles, and ice extent cycles lag ice volume cycles) would make the ice making process at least a partial cause of some of the effects – that could also be tuned to Milankovitch frequencies?